UNSEEN video footage, period clothes, musical instruments and even Paul Weller’s old schoolbooks – complete with band doodles – have been unearthed for a major new exhibition about Woking music legends The Jam. About The Young Idea opens at Somerset House in London tomorrow (Friday, June 26) and will be packed with memorabilia, pictures and music from the trio who ruled the charts in the late ’70s and early ’80s. The idea for the exhibition came from Jam superfan Den Davis, who will be showing his collection – but the momentum to fill 11 whole rooms in the east wing of Somerset House is down to Nicky Weller. The sister of Jam frontman Paul has curated the exhibition and unearthed some very rare artefacts at her mum Ann’s home in Woking, including old cine footage filmed by her late father John, the band’s manager. “We’ve uncovered childhood stuff, previously unseen footage… and we found a load of stuff in my dad’s archive that has never been seen,” says Nicky. “There’s some footage from a gig at the Rainbow in London – that everyone had begun to think was just an urban myth. “Some of my dad’s old cine footage is incredible; we found a little black reel of cine tape that’s been sitting there for 40 years or more. Would we have ever looked at it without this exhibition? I doubt it – that’s what’s nice: it’s made us look and reflect. “Dad would have loved it. He would have really enjoyed this exhibition. And mum’s been great. She’s helped with the archive, and going through Dad’s stuff. 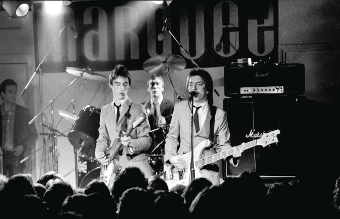 She has worked for her brother Paul for many years since and says he and fellow members, bass player Bruce Foxton and drummer Rick Buckler, have all contributed to the exhibition. “My brother hasn’t said much. I think to begin with he just thought ‘Who would be interested?’ But he popped in to see the building and said: ‘It’s huge – have you got enough stuff?’ But we have, easily. “One of the best finds was some of Paul’s old schoolbooks, in which he did lots of doodles and drew little pictures of himself – in a band. It shows that it was something that he was always going to do. Nicky says sifting through the exhibits has brought back many great memories of The Jam, but says growing up with a famous brother just seemed normal to her. “It’s just the way it was,” she says. Referring to the infamous split in 1982, when Paul decided it was time to leave The Jam, she says: “It was all a bit of a blur. I remember my dad being really upset and the other members of the band coming round and saying ‘Can’t you talk him round?’ But there is no talking my brother into anything once he has made his mind up about something. THE Jam: About The Young Idea opens at Somerset House tomorrow and runs until August 31.